"Just how mature is my company’s quality program?" "What challenges must be addressed to increase maturity?" Just How Mature is My Company’s Quality Program? Is it surprising that many, possibly the majority, of companies consider themselves to be at an “Ad Hoc” or “Controlled” maturity level? 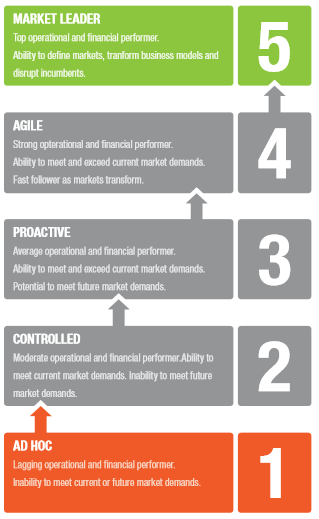 During conversations, often executives immediately self-assess at Level 1 or Level 2 in the LNS Quality Maturity graphic. LNS’s research indicates that only 21% of companies have deployed Enterprise Quality Management System (EQMS). Companies cited quality management issues as the single biggest challenge speeding products from R&D to the field, at 53% of respondents. Does quality group operate like the “Quality Police?" Do other functions (e.g. development) think that quality activities slow them down but add little value? Is a significant portion of a quality professional’s job spent firefighting - performing repetitious corrective actions? Are they performing few preventive actions? Does it take an exorbitant amount of time to get a quality status or a new cut of data? Are spreadsheets, emails and desktop tools the preferred issue tracking and analysis tools? What Challenges Must be Addressed to Increase Maturity? Because each company has its own internal goals and existing landscape of People, Process, and Technology, prioritization of challenges will be company-specific. However, many of these challenges are interrelated. This makes it easier to impact a few challenges at once, and possibly move the maturity needle with one or two strategic, but broad-sweeping moves. For example, quality professionals in many low maturity organizations store much of their critical data on desktops in a mix of spreadsheets, emails, and local applications. This contributes to four of the challenges above - it prevents formal processes, prevents engagement by multiple functions, blocks access and visibility to metrics, and exist as disparate systems. Addressing this issue will impact all four challenges, although other actions may also be necessary to fully address these challenges. Anecdotally, fragmented systems also contribute to the sense of frustration with quality processes. First, quality is forced into the role of policing compliance when others struggle to get access to the data. Also, quality must be the department that is responsible for – and largely execute – quality processes when there is little automation, and little realized upstream and downstream value. These issues can contribute to a sense that quality is a compliance activity and a cost center, rather than a vital part of an organization’s success. Managing Non-Conformance as a document, without IT connection to specifications, lnternet of Things (IoT) data, or machine data, and with limited querying or analytical capability. Managing Non-Conformance in an expert system that is connected both to Manufacturing Operations Management (MOM) and specification data, with automated workflow, connected to Supplier Management, other EQMS processes and development. Data is analyzed with a real-time Business Intelligence system, so that all stakeholders can gain immediate access to quality metrics and health. Both methods are compliant, but Method 2 encourages multi-functional engagement, provides access and visibility to metrics (and possibly data deeper than top level metrics), and makes following processes less labor intensive, error-prone, and demanding upon practitioners. It’s much easier to proactively prevent future Non-Conformances with this level of visibility. It’s also easier to appreciate the impact of quality on the company as a whole. LNS Research’s data backs this up. According to our research, companies that have deployed EQMS solutions have 8% higher OEE, and are 35% more likely to achieve 5 Sigma or better Defects per Million Opportunities than companies without plans to deploy EQMS. 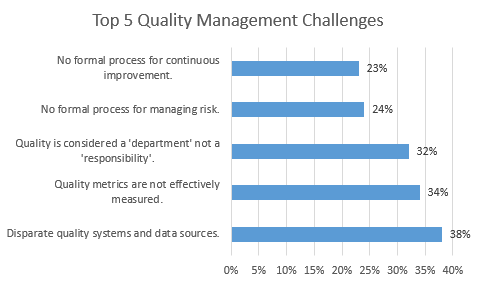 Companies with an EQMS have 26% lower Internal Cost of Poor Quality than those without. Data such as this allows decision-makers to decide and prioritize based on ROI versus “motherhood and apple pie” rationale. 2016: The Year of Change! Does your 2016 plan include the investment in people, process and technology you need to move the dial on the quality maturity? If it doesn’t, don’t hit snooze until next year. Quality management maturity is critical to the success of Operational Excellence (OpEx). In coming posts we will continue to focus on quality management maturity by identifying trends, challenges and strategies for improving maturity; in order to provide the insights necessary for continued enhancements now and in the years to come. Gain a year of free access to new research in our IoT Research Library by completing a survey.